I live in Derby, near cabinet 2 (postcode DE22 1BG) and have been watching g.fast availability (as indicated by the BT Ultrafast postcode / address checker). On "introduction", coverage extended at least to Ruskin Road. A few months ago the boundary of coverage was between 140 and 142 Duffield Road (interestingly the same pole feeds both so line length would be about the same for these two). Now the boundary of coverage is between 118 and 120 Duffield Road (I haven't checked the poles). At this rate you'll need to be living inside the pod to get g.fast coverage. It should be noted that the cable is routed via the back roads (Belper Road, Chevin Place, Chevin Road) so will be somewhat longer than the "crow flies" distance. Does anyone have any idea whether this reduction in coverage as a result of g.fast performance not being as expected, or as a result of a decision to increase the amount of differential there must be between g.fast and VDSL before g.fast is offered? (It is likely that VDSL will deliver coverage in the 70+Mbps range from cabinet 2 to at least Ruskin Road). More than likely it'll be down to the change between what the service was estimated to do pre-build and what they actually discover it can deliver once live, which may affect any estimates being reported by the checker. One way to tell would be to look at the properties that are still on the boundary of coverage and see if their estimated speeds have changed as the predicted coverage has shrunk. I'd expect the estimates on those lines would have declined. Of course this is one of those things that could go in both directions, thus there may be areas where G.fast actually performs better than expected. Nevertheless G.fast is highly sensitive to distance and I noted recently that Openreach are already piloting some new tweaks, which could extend its performance on longer lines. Footprint of G-fast has shrunk I am 5 mins from cabinet and watched it shrink from inset. AFAIK, the limit of G.FAST is ~300 m.
300 m from cabinet you will get less sped than you get on FTTC. I wouldn't describe it as a limit, since performance will vary depending upon more than just line length. Generally though you're unlikely to get ultrafast speeds beyond around 300 metres in the UK, which means you wouldn't be able to order it at that point either due to the 100Mbps fault threshold. But in theory, with future upgrades, G.fast might work at up to around 500 metres.. in theory. The current cabinet based setup is far from ideal for G.fast. @Kits. I'm 285 metres at least by walking it ... and I get full VDSL speed. An openreach guy I asked while he was tinkering with the pod said I can expect to get at least 200mbits. But then you never know if they're just making it up on the spot. 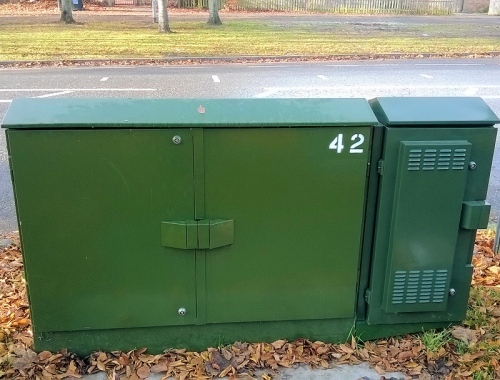 Getting frustrated watching all the cabinets go green for G Fast on the thinkbroadband maps and not my street which has 200 houses on it nearly 6 months since the pod was fitted too. I did a check on every home between my house and the cabinet house right next to cabiet is only expected to get 200Mbps his atached home next door has less 3rd house is expected to get more. It is all over the place and I was which I had a screen shot was going to get less than my FTTC which they have since removed. Last check only 5 homes from the cabinet can get G.Fast rest do not show it anymore as speeds were expected slower than FTTC. I have already had talks with openreach and they say I am too far from cabinet so cannot trust everything. If I put my address in not offered phone number not offered but thinkbroadband says I can get it. The openreach engineer commented that they plan to do more with G.Fast, not entirely sure what he meant. He also informed me that my line is theoretically able to handle 500mb as his tests showed that speed, maybe that will come in a few years. Openreach has talked about 500Mbps being a target for UK G.fast before, but that was before they adopted the 'cabinet approach' (instead of FTTPdp via smaller nodes). The hardware is only now becoming available to do this, so it may be awhile before we see them trial it in the UK.. if that happens at all. I find G.Fast infuriating,neighbour can get about 180Mb, I can't due my line routing,goes from a pole over canal to another pole, from there it then comes back over canal bridge via underground ducting, pass my pole again, back to the cabinet, probabaly adds 80mtrs or more, to my line length. Have dropped OR a email about this,unlikely they wil do any thing, but even before G.Fast, the arrangement has caused problems for years,contractor cut through cables yet again,& no phone/internet all day, back in summer. Well I’m damn confused. In my village, well it’s apparently classed as a tiny tiny town, we have FTTC, FTTP, FOD, and right outside the exchange building I saw what I’m sure is a G.Fast pod, it’s out next to the telephony PCP right? The Fibre cab just the other side of the entrance to the exchange is the same as always..??? And BT are going to upgrade me for free to 80/20. I don’t get it? You say it’s shrinking yet in my little corner of the world, in rural North Dorset I might add, we appear to have installed every bit of comms technology going? As it is I get damn good speeds, a totally rock solid 10 up and 55 down, and my line stops outside the exchange where the cans are! We used to be lines direct to the exchange. We also have a Sky and TalkTalk LLU. Make what you will from this. I’m just happy to get a free speed bump as I was thinking of going to Idnet for it, at least now I’ll be able to see how it performs first. Put your details here, https://www.homeandbusiness.openreach.co.uk/fibre-broadband/when-can-i-get-fibre?utm_source=Openreach+Splashpage&utm_medium=when+can+I+get+fibre+link if G.Fast it will state it as the technology. What is meant by shrinking is when BT first announced G.fast they said it would reach further from the cabinet. So the shrinking is not in the supply but the distance from cabinet to home I can get the max speed if I reduce my SNR to the 3db sadly my router seems to not like the 3dB SNR. I find hard settnig the SNR in my router give me a more stable line at the loss of some speed. F.fast is at my cabinet, even though I can see the cabinet I am to far to get G.fast. You are alos mixing up the two technologies G.fast is speeds over 100 Mbps to 300Mbps if they regrading you to 80-20 that is just normal FTTC. I’m not mixing any technologies up, as I said we seem to have every one going hence the list I posted..? As for SNR’s, sounds like you’ll have to wait for better chipsets to be launched to get stable lower SNR’s. Although 3 is pretty low. 3dB is what BT work as normal now on FTTC only draytek routers seem to not like it so low. Drat, I went and checked out the pod more closely and sadly their are no air vents on it so I’m going to guess it’s an extension pod for more telephone lines? Plus no other CAB in my area has any pods, never mind I’ve been enjoying my free speed upgrade getting a solid 65 down and 17 up on speed tests. I’ll try it out for a while and then really need to decide if I stay with BT or move to Idnet, hmm.